Young woman is making web payment holding bank card and working with laptop sitting on bed at home. Buying things online, internet and modern technology concept. Consider the example of the payment system when paying for purchases from an account in a bank. 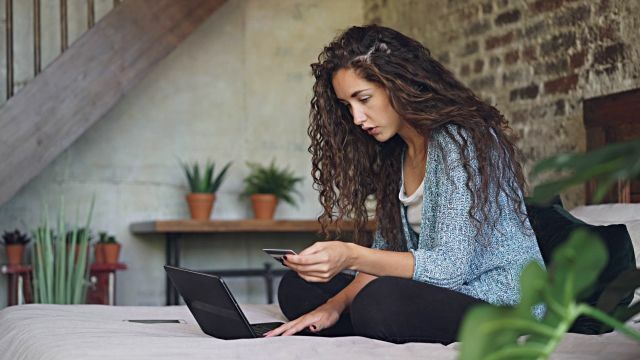 The buyer connects via the Internet to the store’s Web server, forms a basket of goods and sends the invoice request to the store. time and date of the transaction. From a civil point of view, this account is a proposal to conclude a contract (offer). The buyer certifies with his EDS the bill presented to him and sends him back to the store, thereby making an acceptance. The contract is concluded with the signing of the invoice issued by the buyer. In the system, the account signed by the buyer becomes a check. A check signed by two EDS (store and buyer) is sent by the store to the Bank for authorization. keeps a copy of the check in the database of the bank. As a result of inspections, a permit or prohibition of payment is formed. the store provides a service (releases the goods). the buyer is refused with a description of the reason. The buyer fully controls the process of making a purchase. As a documentary confirmation of the completed transaction, each party will have signed electronic signature checks confirming the fact of the transaction and having legal force. the parameters of your card (the name of the payment system to which the card belongs, the card number, the expiration date of the card, the name of the cardholder in the transcription as it appears on the card). Describe the main communication models on the Internet between companies and consumers. What is the difference between online communications and traditional media? Which products are easiest to sell online? How can consumer support be implemented online? Describe the procedure for buying online.